The EDC Rainwater Harvesting System is a revolutionary new development in rainwater harvesting for urban residential homes. The system has been designed to fulfill a permanent rainwater harvesting solution that allows for capture and distribution of rainwater for non- potable usages. Pilot phase testing that will entail installation and testing of the Pressure Distribution Module is an essential next stage requirement that will confirm the practical and sustainable functionality of the Pressure Distribution Module (PDM) which is key towards utilizing harvested rainwater practically without the need of an electrical water pump. EDC Tanks is a young organisation in early startup phase. EDC Tanks is pioneering product development in the field of rainwater harvesting and greywater technologies to provide advanced and sustainable product solutions. The organisation is still in early startup phase and is also seeking investment towards further product development. The EDC Tank System advents a new design and technology aimed at providing domestic urban consumers with RWH ( Rain Water Harvesting) products that are aesthetically suitable, practical, low cost and effective towards harvesting and utilizing rainwater for non-potable consumption. Our Primary Tank design provides dual functionality of a down pipe as well as a water tank, and replaces conventional down pipes. 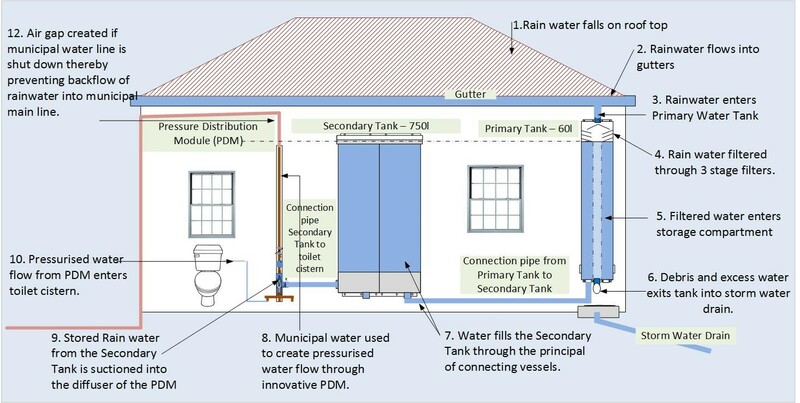 The design of our PDM uses a high pressure water source to suction and pressurize harvested water which improves utilization and distribution of the harvested rainwater in a very efficient and effective for water supply towards toilets, garden hoses and other non-potable water consumption. This system also ensures that when there is no water in the tanks, the system just uses the municipal water without the need of any switch or manual valve. The Primary tanks are slim in design and offer consumers the option to install at every point around their home in replacement of a down pipe. Water collected in these tanks can offer drip irrigation for gardens, water for washing vehicles and paving, filling or swimming pools and to fill toilet cisterns. The technology is being design specifically for use of either harvested rainwater or greywater and aimed towards solutions for urban residential and commercial solutions. The Pressure Distribution Module (PDM)is best suited as an application towards supplementing water consumption in toilets. The PDM performance is based on water pressure and nozzle diameter. The PDM can offer a water saving solution that can be as low as 1:3 fill ratios. i.e. for every 1 litre of potable water, 3 litres of rainwater will be used to fill a toilet cistern.